Founded in 1997, in short span of time Unitorq group has positioned itself at the foremost of innovation, design, development & manufacturing of clutches, brakes and combinations to various segments of domestic and overseas industries. Unitorqgroup has three states of art manufacturing plants at Udaipur, best known as city of lakes, in Rajasthan, India. With total plant area of 5000 m², we are exporting our products to over 16 countries, including USA, U.K, Germany, Italy, Brazil, Belgium, Turkey, Iran, Singapore, Hong Kong, Argentina, Kuwait, UAE and many more. Our technical expertise includes design and manufacturing of clutches & brakes for the use in Navy Deck Machinery to highly sophisticated Rocket Launchers and anything in between.We are sure to design, develop and manufacture right clutch or brakes from simple to complex applications. Quality of a product is what brings a customer back to a company with repeat orders, and Electromagnetic Engineers Private Limited is committed towards providing international quality products to its clients. All the processes, right from the sourcing of raw materials to the dispatch of the finished goods are carried out under the stringent supervision of quality inspectors. The final products are made to undergo a series of tests to judge them on the parameters of strength, performance and durability, and only the best from the lot are then dispatched for sale into the market. 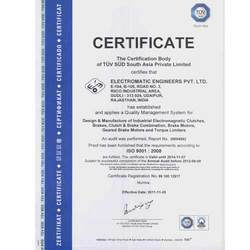 As a result of our strict approach to quality aspects of the goods, we have been accredited with the much coveted ISO 9001 and CE certifications. 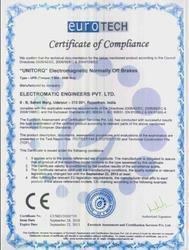 Our company have Certificate of Compliance. We, Electromagnetic Engineers Pvt. Ltd., have a large production unit spread over a sprawling area. Our factory occupies an area of 5000 sq. m and a built-up area of 2,000 sq. m. This manufacturing unit is outfitted with the requisite machines and equipments to carry out an uninterrupted manufacturing of goods. A team of highly qualified professionals is at the helm of affairs, carrying out all tasks with precision and leaving no loopholes at any stage. These professionals are imparted regular training to keep them abreast with the latest happenings in the technological world, in order to help them perform better. USA, UK, Germany, Italy, Brazil, Belgium, Turkey, Iran, Singapore, Hong Kong, Argentina, Kuwait, UAE, and many more regions worldwide. We are committed towards delivering the best to our clients at all times. As a result, our professionals work closely with them in order to completely understand their requirements and provide them with the most apt solutions to ensure maximum satisfaction. Regular feedback and suggestions from the buyers help us in knowing our weaknesses and aids us in taking corrective steps towards the same.